Ready for something quick, versatile and not made of turkey left-overs? Yeah, we all are! After Thanksgiving and the football game last weekend, it's nice to find a respite from over-indulgence on all levels. Over the years this has become a favorite. I like it over fish or chicken but it works nicely as a warm dipping oil for bread. It's definitely fancier than olive oil and no one has to know how easy it is to make. Kick off your Civil War party with a tray of these. The Midori Illusion is the perfect way to add game day color for U of O fans! Directions: Shake ingredients with ice. Be sure to shake well, to let the Midori mix thoroughly with the other ingredients. 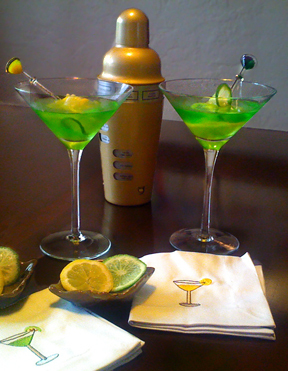 Pour into a martini glass and garnish with a lemon and lime slice. This year's Civil War game got me thinking that I needed a new cocktail for Oregon State fans. I started with a Broadway's Alibi and jumped off that to what you have here. They used tequila instead of vodka and nectar that made it a bit too sweet for my taste. I've never thought about using carrot juice in a cocktail. It's surprisingly good! Have you tried this Blk. water yet? I've been so curious and today was the day I decided to give it a try. First off, it doesn't have a taste of its own. It's enhanced with fulvic acid which, apparently, is responsible for it's black color. Be warned though, freezing this stuff is wild - the black minerals fall to the bottom and it separates into the layered ice cubes you see below. At least 2 hours before serving, make the Blk ice. Use a small ice cube tray so you can use a lot of cubes. Pour all ingredients into a glass, stir, and add ice. If you decide to make a pitcher of these, don't add the ice to the pitcher, add it to the drink. Be bold, try this one. This is a great time of year to take advantage of the local cranberry crop and offer a different yet seasonal dessert. The tart cranberries and the sweet, dried fruit are a bit of a surprise - and a nice change of pace during pumpkin pie season. I started making a recipe similar to this for a friend with a gluten allergy. Since then, I switched to organic fruits and local honey. This recipe has a lot of room for substitutions. I listed some of them at the end of the recipe. I hope you share yours, too! I've been making ravioli for years, duped into it by my father who swore the family tradition had to live on. Only later did I learn that there was no such tradition, he was just trying to get me interested in cooking. It worked. We got the hang of it quickly and had a lot of fun trying new fillings. This year I decided to try a more seasonal approach and I found a few recipes for pumpkin ravioli. 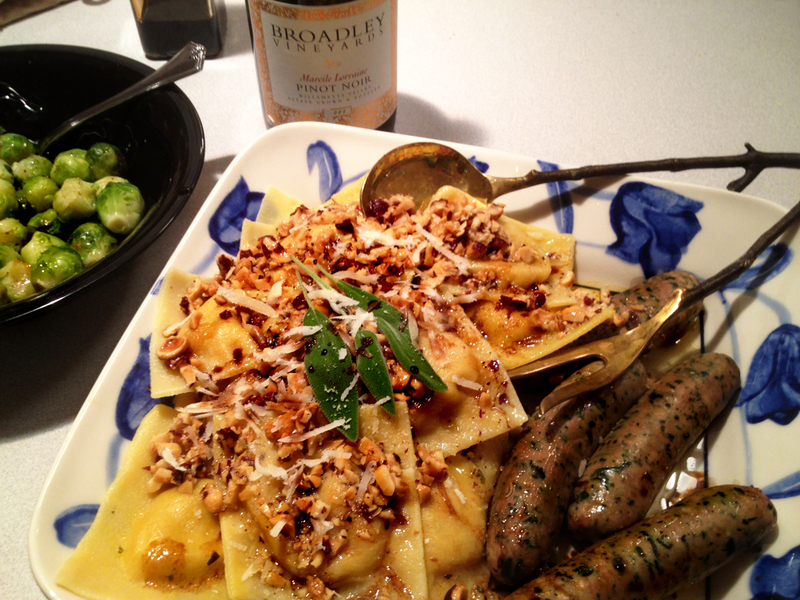 This one is loosely based on one from 1986 and published in The Wolfgang Puck Cookbook. For the more intrepid, feel free to make your own pumpkin puree, I used canned, organic pumpkin without seasoning. You can make these a day ahead and refrigerate them until about 20 minutes before you're going to cook them. The steps are easy but, if you've never made ravioli, prepare to feel clumsy. I was glad that my friend, Rina, wanted to get involved. It was a fun time and the extra hands were helpful. Here's a tip; don't believe anyone who says you don't need semolina flour. I use half semolina and half all-purpose flour. The gluten in semolina makes it possible to roll thin dough that doesn't explode in the boiling water. I bought only the amount I needed from the bulk aisle at The Kiva in Eugene, Oregon. If you're not familiar with Caponata, think of a Sicilian version of chutney; or maybe ratatouille -- made into a condiment. Here in Oregon I find that the eggplant is available just about the same time the tomatoes are losing their summer glow, that's the time to act. The flexibility of this recipe is awesome. Its cornerstone is eggplant but you'll add olives, celery, capers and other fresh vegetables that complement each other and add to its complexity. It's savory, sweet and sour all at once. This dish is best eaten the next day, when the flavors have developed. It keeps for several weeks as long as it's refrigerated. A little goes a long way and it's safe to say that it's not for the faint palate. Serve it on crostini, or put a spoonful on fish. Lively and bursting with flavor, this one is delish! There's a fair amount of prep to this recipe, so put on some good music, sharpen your knife and enjoy cooking. This is the triple-threat of gingerbread! 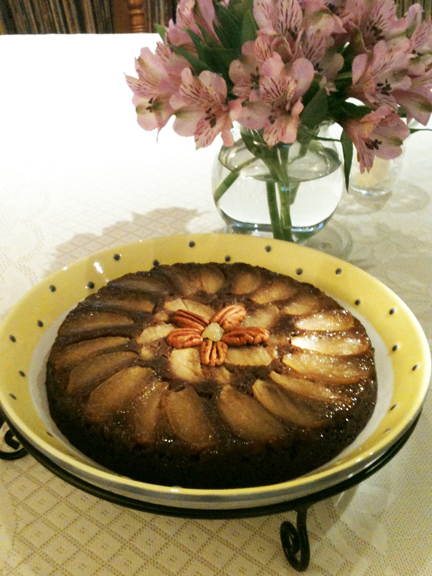 It uses candied, fresh and ground ginger to give the cake its full-bodied flavor. For a more traditional gingerbread taste, or if all three kinds aren't on hand, it can be made with ground ginger only, just double it. 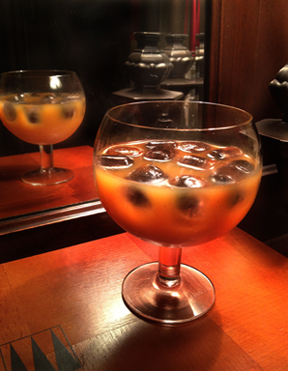 Try this favorite to take the chill off an autumn day. Years ago, I found the recipe on a website called yumyum.com and decided to make a few adjustments to make it my own. I like how simple this is to make and that it doesn't have the typical spices that we associate with pumpkin. No nutmeg or cinnamon in this recipe. I'm using pumpkin, but butternut squash is a nice choice, too. 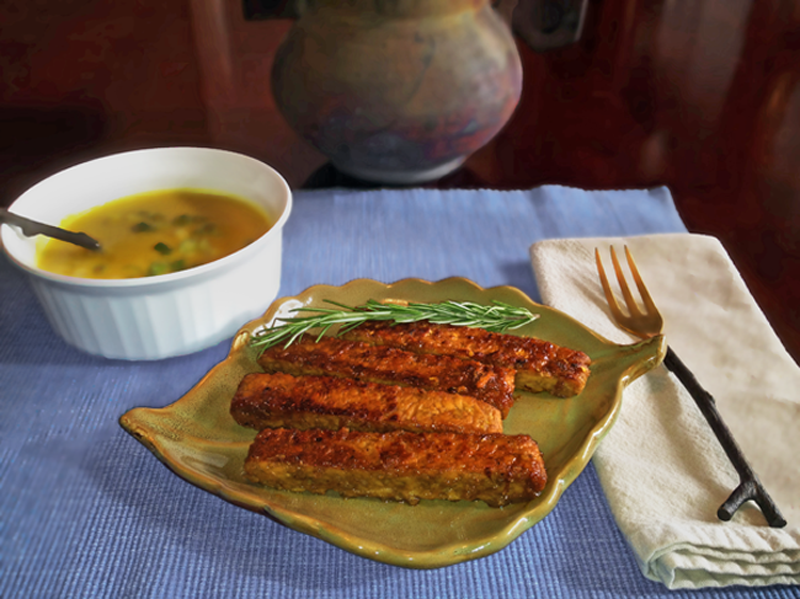 To complete this meal, try the Citrus & Maple Glazed Tempeh. As nice as this soup looks, it all went south right after I snapped this photo and I decided to blog about it. After all, we're all here to learn something and experience doesn't always make for perfection. I won't spoil it for you here, just read And then I broke it..., following the recipe. To marinate, or not to marinate? That is the question. 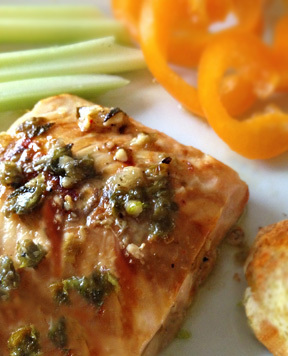 Recipes for marinades abound but I find myself skipping it because I don't have the time. Here's an option for a glaze that will get your dinner on the table in less than an hour. The citrus and ginger combo really brightens the flavor of tempeh, and the maple syrup caramelizes and adds a little sweetness. If you're not familiar with tempeh, I encourage you to give it a try. I used organic tempeh from Surata Soyfoods in Eugene. I like the multi-grain, version for its nutty flavor but the original flavor is great, too. 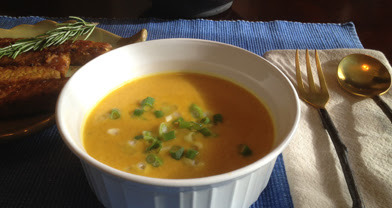 Pair it up with Cream of Curried Pumpkin Soup in the fall, or salads in the warmer months. It's also great inside a wrap year-round. 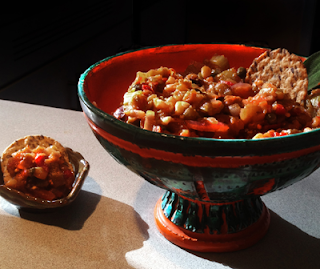 This time of year I find myself looking for healthy appetizers that are easy to make. I found this recipe at the deli where I bought the cheese and it's become a favorite of my wheat-free friends. 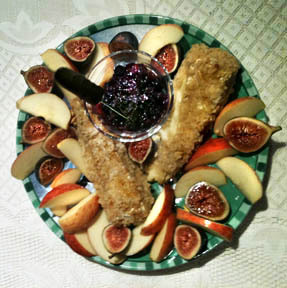 I like the rustic feel of this appetizer and I serve it with with fresh figs and apples but it doesn't hurt to have some crackers or a baguette on hand.